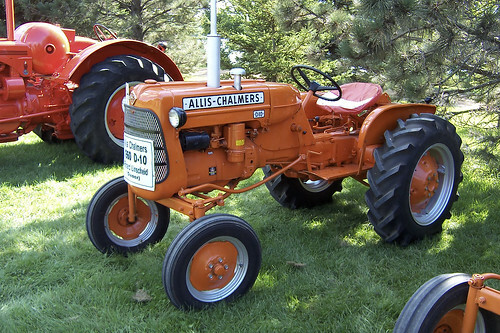 Allis Chalmers introduced their Model D10 farming/agriculture tractor in 1959. The D10 was produced for eight years, with a total of about 9,100 being manufactured. The D10 was a two-wheel drive tractor with a four-speed sliding gear transmission. At the D10’s start, it produced about 24HP. After three series updates, however, the horsepower had been increased to 31HP. Allis Chalmers’ D10 had a wheelbase of 78.75 inches, and a weight of 2900lbs. The engine was an Allis original, and was run on gasoline. It was a liquid-cooled four-cylinder engine that, in its initial production year, had a maximum PTO power of 28.5hp, a maximum Drawbar power of 25.7hp, and a maximum Drawbar pull of 2,409lbs. After a Series upgrade, the Nebraska Tractor Test was completed in 1962 and the max PTO power had increased to 33.5hp, and the max Drawbar power had increased to 28.8hp. The Allis Chalmers D10 was successful, however by the late 1960s, farmers were beginning to flock to the more powerful diesel-run tractors. Allis saw this trend, but could not compete at the price point that the customers were wanting. My Dad has a 1961 D-10. Does anyone know where I can get information on the correct paint scheme for this tractor? I think they were all Persian orange and then at some point the cream color was added. Any info would be helpful. To my knowledge, they were all Persian Orange with the cream color, up to the 7000 series. THE TRACTOR IS USELESS WITHOUT EITHER ANOTHER HOLD POSITION VALVE OR MAYBE A MACHINIST CAN CREATE A NEW PIN. DOES ANYONE KNOW WHERE THIS RARE HPV CAN BE FOUND OR SOMEONE TO REBUILD IT? Where could I get a snap coupler chisel plow and a rear cultivator for a d-10 AC? I have a 1963 Allis Chalmers D10 ~ high crop. It runs and is in fair/good condition. I was wondering if anyone could tell me what this tractor approx. value of this tractor. I have a 1962 or 63 Allis Chalmers D10 ~ high crop. It runs and is in good condition. The serial # on the tractor is AM 4617-3. I would appreciate it if someone could give me a little info on this tractor as well as the value? I am looking for a hood for my 1963 Allis Chambers D10. Please E-Mail if you know the where abouts!!!!! Just purchased a D-10.. kind of rough, but runs real good. Anyone interested, contact by e-mail, way down yonder close to New Orleans. 236081 (PLATE GEAR TRACTION BOOSTER PUMP ). Any help in locating this part would be appreciated. Does anyone know of someone who could cast / machine this part ? Hello Teresa Smith, I would be interested in some of the parts that you have. Please send me an email of what you have. Thanks, Mike. Looking for cultivators for a D10 and D12 Allis Chalmers tractors. Call 256-374-6415 if you have one for sale. Also looking for a intake/exhaust manifold for D12. Does anyone know what a 1966 Deutz tractor would approximately be worth? It has some rebuilt on it. 120 or 80 hp. 2 wheel dr. I have a D-10 Allis Chalmers with a front end loader, no 3 point hitch. I would like to know more about it and what’s it worth. Thanks Paul. Beautiful restore. I have a D10 or D12, #10-2430S on torque housing. I cannot find info on numbers. Thanks Frank. The serial # for a D-10 is on the left side upper portion of the torque tube housing. You may need to scrape the paint off. It is where the engine connects to the torque tube housing. There are Allis books available. Check with Old Allis News. To Teresa Smith: Do you still have the D-10 Allis with belly mower? Call 804-586-4386. I have a 1960 D 10 allis. I need a round shaft that you pull to dump the bucket on the front in loader and this shaft spring loaded resets back in the bucket after dumping. If you know where I might find one Call is 1 406 793 5640 or email me hlm5699@blackf o to.net. Does anyone have a pdf copy of the Operators and Shop Repair manuals for a 1959 AC D10 that they can share? If so please email me a copy to br45nine@yahoo.com. Also need to know how to remove the rear bent pto on back of this D10 and replace with a good one?